With The Fate of Old Mother Orvis, The Future Kings of England take their place alongside Porcupine Tree as one of the U.K.’s finest practitioners of neo-progressive psychedelic rock. 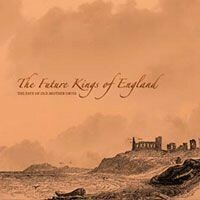 Though one can hear clear echoes of Pink Floyd, King Crimson, Nektar and other progressive pioneers from those long vanished halcyon days, The Future Kings of England have undeniably fashioned a sound all their own on The Fate of Old Mother Orvis. The breathtaking “Mustard Men” shifts between striking contrasts of elegant melodicism and crushing power rock to produce a masterful epic whose majestic sweep of guitar and mellotron transfixes the listener. The descending/ascending scale guitar arpeggios that provide the song’s denouement are simply cathartic. The same interplay of forces between Ian Fitch’s guitar and Steve Mann’s keyboards infuse “Dunwich” with a grand atmospheric quality that is equally symphonic and rocking. Both pieces display the group’s deft understanding of the use of space and dynamics within a compositional framework. The lovely pastoral “Children of the Crown” evokes the group’s fondness for fusing the ancient folk tradition of Albion with the hi-tech modernity of progressive rock in the third millennium, a fusion highlighted by the group’s superlative use of such traditional instruments as banjo, autoharp and dulcimer. Darkening their sonic palette for the title track, the group explores the gothic ambiance provided by the legends and landscapes of their native Suffolk. The quasi-folk elements of this piece meld wonderfully with the psychedelic wail of Fitch’s soaring guitar (here, a direct descendant of similar excursions taken by Steve Hillage on Fish Rising) and Mann’s subtle yet essential synth colorations. At an impressive and lengthy 18:11, “The Fate of Old Mother Orvis” moves through a variety of moods and impressions that qualify it as a legitimate classic of early 21st century progressive rock. To say The Fate of Old Mother Orvis is highly recommended is to understate the matter considerable. In a decade hence, aficionados of progressive rock may well be referencing The Fate of Old Mother Orvis in the same breath with In the Court of the Crimson King, The Lamb Lies Down on Broadway, Angels Egg and Meddle.